Adammarquis: A learning question. I think I've discovered ways and means of developing most aspects of my game, but methods to hone my understanding of direction of play and my judgement of which open board areas are best elude me. Comments like "You approached from the wrong direction" and "you went for the uninteresting side" are common in my games. Both are, for me, rather subtle issues; I don't get much insight on them by looking at pro games or my own. Where does one develop this sense? As a secondary question, how do the problem ranks over at go problems stack up with actual ranks? I see that the ranks are based off the success percentages, but I wonder how real life ranks compare. Bill: Here on SL there is some material about the direction of play. Take a look at Some Basic Tips for Fuseki for starters. Then check out other fuseki pages and look through Big Question Mark pages. You might also post your own big question mark page about a position from one of your own games. Charles Closed side - closed mind is about this type of question. Chris Hayashida: If you're willing to invest in books, I would say that Go Seigen's A Way of Play for the 21st Century and Kajiwara's The Direction of Play would help improve your sense of direction. I would guess that they would be good for single-digit kyu players, though, since they assume that you have a working knowledge of some joseki. Charles Those books are respectively amazingly difficult, and difficult. 'Direction of Play' is a typical catchpenny title, for what is a cobbling-together of some old magazine articles. Not that it is a bad book. adammarquis: I've a similar view of things Chris. One of the books I got the most out of as a newbie was (as Crux has suggested I look at again) Whole Board Thinking in Joseki. 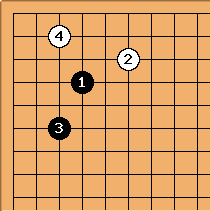 Of course, the joseki and such and continuations were useless to me, but it was where I learned my positional judgement. In each solution, it shows the wrong answers and says why they are undesireable. Just by skimming through and looking at these features, I learned my first positional judgement. Oh, these stones are too close, overconcentrated. Oh, this wall isn't useful but this one is. 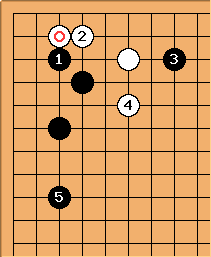 I will admit that most of what I got out of Seigen's "Way of Play" was that Go Seigen is 9-dan pro, and I am not. 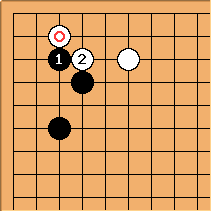 crux: You might also want to try Whole Board Thinking in Joseki. Bob McGuigan: Yang Yilun's new book Fundamental Principles of Go has some good basic material on judging where the biggest areas are. The short story: I'm playing on Dashn as white. I'd judged the nobi at to be just slow rather than sinister trick play (I still think this), so I jumped to anyway. Then black played . After some thought on the issue, I still haven't found a line that I feel is properly good for white here. Maybe I am being unreasonable. What would you play after the strange ? Charles It ought to be good enough to play at a. I'm not convinced that is good, if will follow. In a hard fight it will look heavy. at a, Black jumps to the right, White jumps at b: is Black doing well? adammarquis: Thanks for the new ideas. I wasn't going to, but I'l admit this: In the game white played a, black played c, white made a 30k mistake down the road, black won. I get flustered easily. Bill: If the ladder works, is a strong response. Bill: Otherwise, is OK, reaching the same position as after - , . 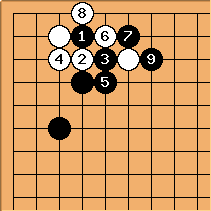 Bill: Or White can play , reverting to joseki after - , . What are good shapes to run with? What are good shapes to make eyes with in a small or awkward space? Rich: Not sure I understand - what do you mean, a good shape to run with? A one-point jump is generally a fast, light way to move out, but a lot depends on how, why and where you're running, and how strong your opponent is. As for making eyes, ponnuki is a very strong shape. ThaddeusOlczyk: What he means is exactly what he asks. What are the shapes you should aim for when running, and what are the shapes that you should try to prevent your opponent from making when he runs. Alternatively, what are the ways to determine the vital points of a running group? When an opponent understands these things better than you, then it seems like his running stones live and yours die. Even if you start from the same position. Kenn: This occurs a lot in handicap games between myself and dan players at my club, sometimes even as the opening move (as depicted). I am usually not sure what to do, and play a or b. Are these moves bad? What would be good? Bill: Both are OK, as well as c - h. Ba is strong. It puts pressure on while strengthening . Also, it preserves symmetry. In a teaching game, I like a. It shows spirit. I would also be impressed by tenuki. After all, the exchange, - , early on in the game favors Black. Obviously there are times when one does not play lightly. For example the reply to a san-san invasion is not very light. So when do you play lightly? Maybe more to the point, when is light play not necessary. Almost a reverse question to the previous one. ( Though thick and light are not opposites, there is generally a correlation between light and thin not thick? : and between; heavy ( not light ) and thick. So under what circumstances thick play is not necessary? Bill: This is a very good pair of questions. OC, one should avoid making heavy plays and thin plays. But then, when should one play lightly rather than thickly, and vice versa? This is in part a matter of style. But style isn't simply a question of thick vs. light. For instance, I have a thick style of play, but also a miai-ish style, which is on the light side. Also, frequently when you sacrifice stones, you regard some stones lightly, throwing them away, while building up thickness in the process. Also, you may regard stones differently at different times; for instance, you may make thickness at one point, and treat it lightly later, trading it in furikawari or throwing it away. Also, thick play early on can lead to light play later, when you have no fear of ko because the opponent has few ko threats against your thick positions. Generally it is important to play lightly when entering or reducing the opponent's sphere of influence. You will look for chances to sacrifice stones and to keep options open. The opponent will try to reduce your options and make your stones heavy. It is important to play thickly when you have invested so many stones in a position that you cannot throw them away. You do not want to give your opponent opportunities to make them heavy and attack them. It is also important to play thickly in preparation for your own attack or for an invasion. Your thickness can provide a safe haven for your own stones, a rocky shoal for your opponent's. Thick play can also consolidate a lead. What should be done when an opponent drops an invading stone into every extension you make as soon as you make it? The pros don't play this way... why not? Bob McGuigan: With an opponent like that you'll have to develop fighting skills (reading, shape, tesuji and life and death, etc.) But actually some of these invasions will probably be reasonable while others will be unreasonable. Pros don't play that way because making unreasonable invasions creates weak groups which are targets for attack. This isn't specific tactical advice, but against such an opponent you need to play solidly but not submissively. Try to keep your groups from being closed in. Watch for splitting attacks and ways to keep the other player's weak groups from connecting. 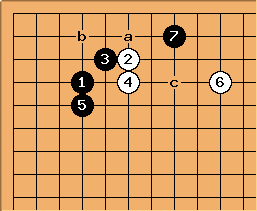 Bill: Usually I do not recommend learning joseki, but there are a number of joseki that involve early invasions of extensions. Seeing how they are handled should give you some ideas and some confidence.